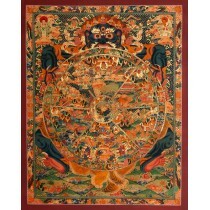 A thangka is a painted banner which is used to be hung in a monastery or family altar and carried by lamas in ceremonial processions. 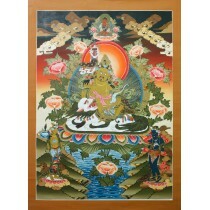 This thangka painting depicts the Manjushree deity. 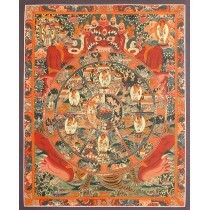 Mostly, thangkas are used for depicting Buddhist deity, scene or mandala. 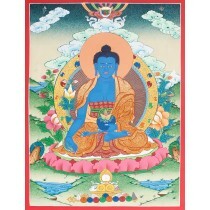 For, this thangka artist have used poster color with gold on canvas. 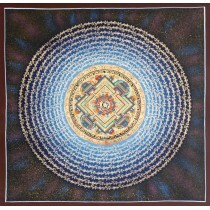 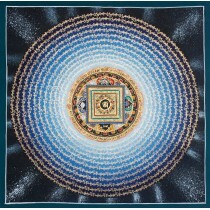 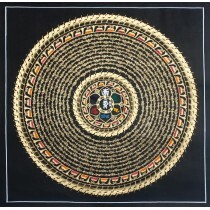 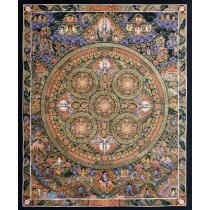 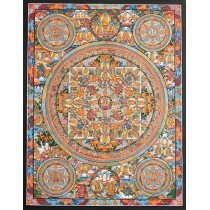 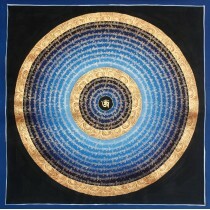 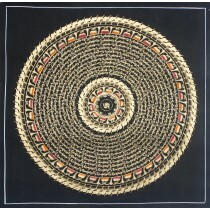 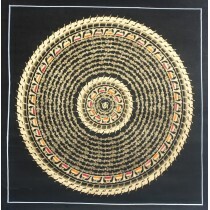 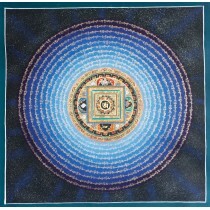 Thangka measures 15.5" of width and 20.5" of height perfect for wall decoration. 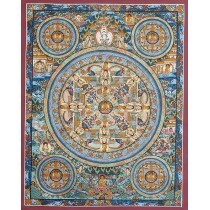 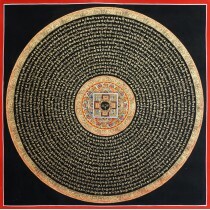 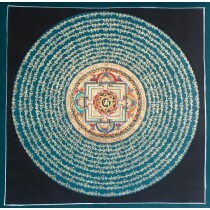 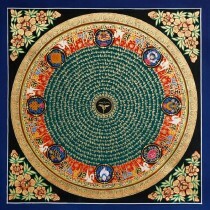 Thagnka painting is the only detailed description of the technique and principle of the thangka art. 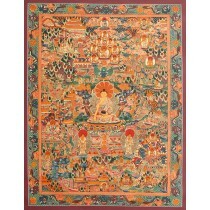 Thangka served as important teaching tool depicting different Buddhist deity. 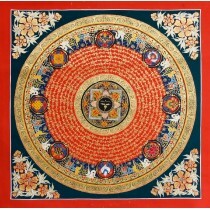 Manjushree "God of Divine Wisdom" whose worship confers mastery of the Dharma, retentive memory, mental perfection and eloquence. 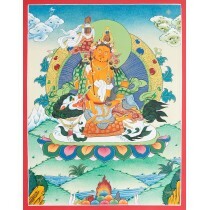 Manjushree is also one of the forms of Bodhisatwas and he symbolizes wisdom. 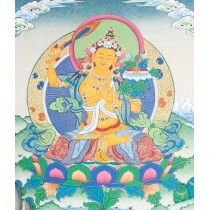 In Nepal, he is considered as the founder of Nepalese civilization and the creator of Kathmandu Valley. 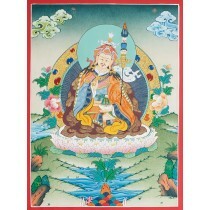 According to the tradition, he was a Chinese saint. 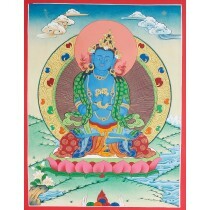 His intuition told him of the blue flame (symbolizing Adibuddha or Swoyambhu) on a lotus in the big lake of Nepal. 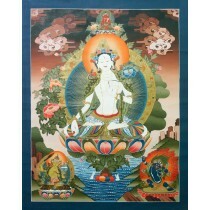 He went there to offer worship, but could not reach because of the water. 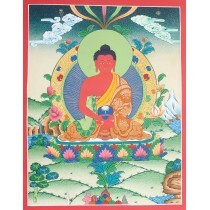 He cut with his sword the southern wall of the hills. 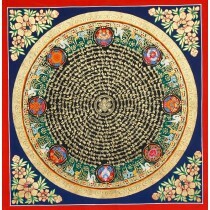 The water of the lake drained to the south. 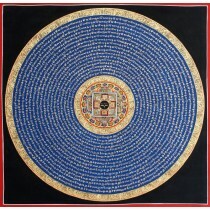 The dry valley became Kathmandu valley. 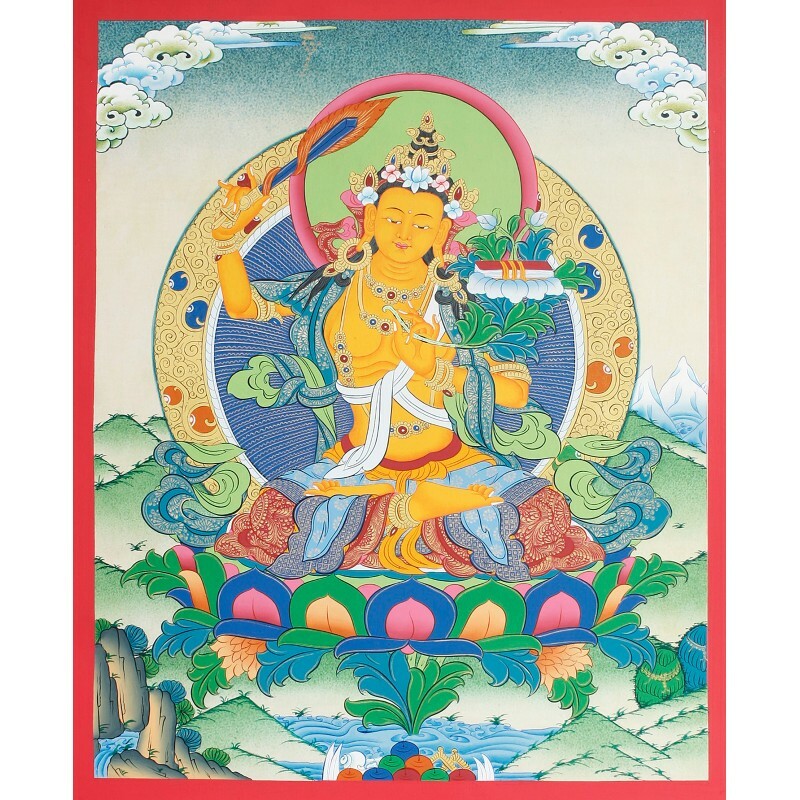 He carries the sword of wisdom and light in his right hand and prajnaparmita manuscript "the book of divine wisdom" on his left on the lotus blossom. His left hand will be in teaching gesture (Jnan Mudra). 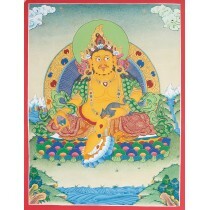 He is also called Manjunghose, Manju bara, Vajranga and Vagiswara. 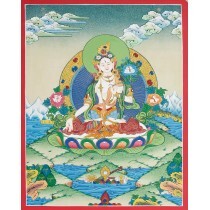 People believe that the worship of Manjushree can confer upon them wisdom, memory and intelligence etc.